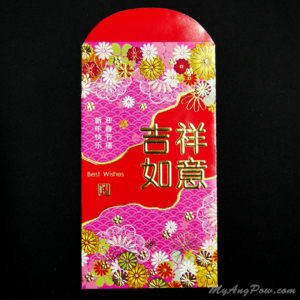 This red color red packet featuring cute piglet welcoming you with a smile, with a gold stamped wording “猪年大吉” which means “wishing you a great year ahead in the year of the pig”. You can use this during Chinese new year and other thanksgiving occasions. This red packet is designed and distributed by HuaJi. 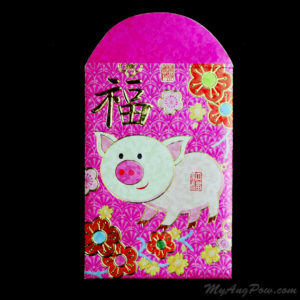 This red color red packet featuring cute piglet welcoming you with a smile, with a gold stamped wording “猪年大吉” which means “wishing you a great year ahead in the year of the pig”. The pig is surrounded by beautiful graphical clouds and flowers. At the back cover of the red packet is a red background. The lid of the red packet is semicircular in shape. There is a slot to secure the lid. It will allow you to reuse the red packet several time.